Learn how to prepare a yummy restaurant style homestyle Mai Fun stir fry. Mei fun (Mai fun) is a popular stir fry noodle in Southern China and Singapore. 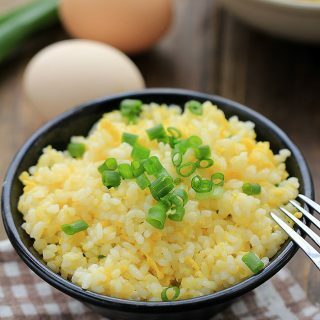 Usually mei fun is made from rice and water without salt. They can be quite good in soups and stir fries. There are several types of noodles made from rice and water. They share lots of similarities but popular in different region. 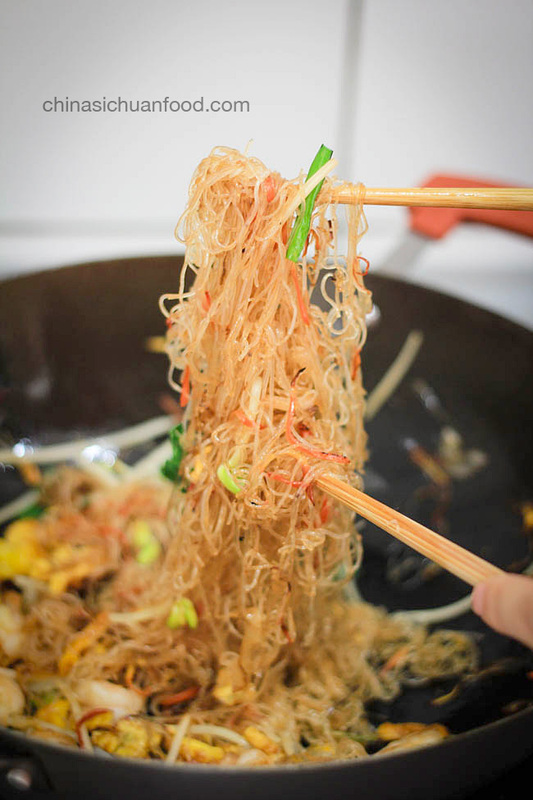 In western part of China, like Sichuan and Yunnan, we have thicker rice noodles (sometimes also called rice sticks, 米线). Mei fun is much thinner than rice sticks. 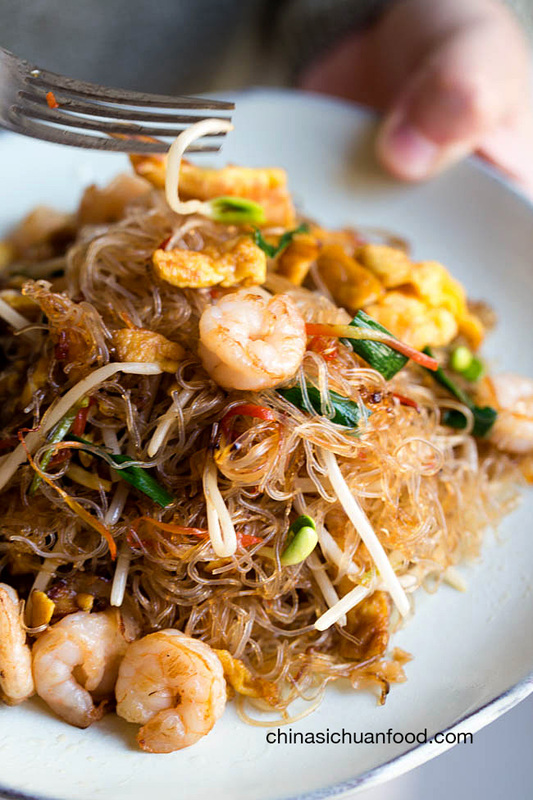 When ordering a chow fun, you can choose to chow ho fun or chow mei fun. 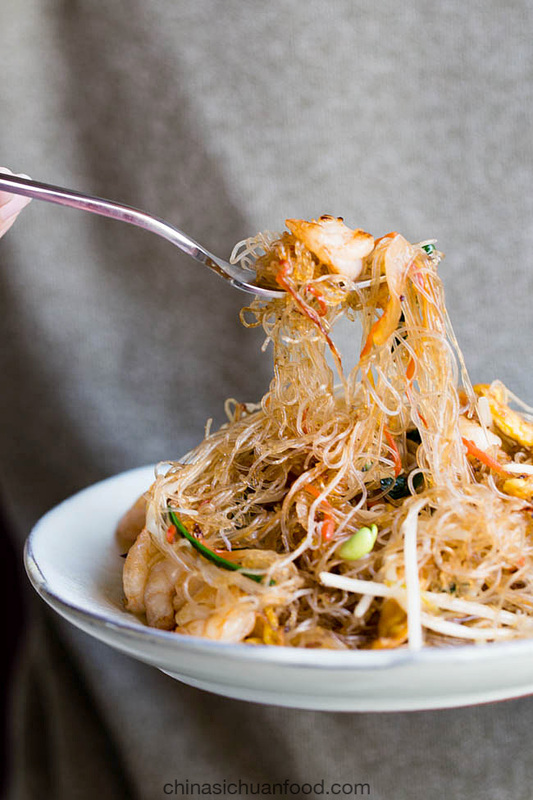 Ho fun is steamed wide rice noodles. You may hear of the famous beef ho fun. 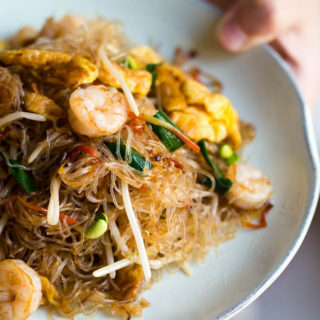 The most famous dish using mai fun is Singapore style mai fun stir fry. 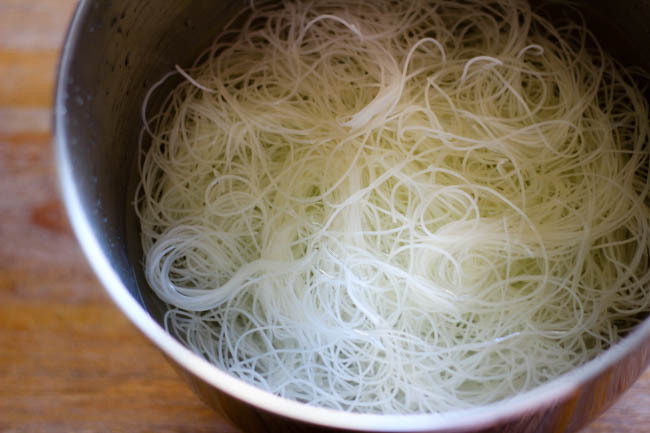 1.Pre-soak the rice noodles for around 20 to 30 minutes until soft and then drain. (You need to drain the noodles completely, otherwise they can be quite stick when stir-frying). 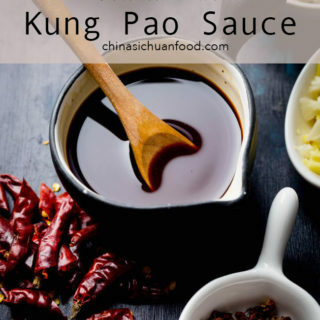 Slice other ingredients and mix the stir fry sauce in a small bowl. 2. Heat up around 1 tablespoon oil in pan and make a thin omelet. Then shred the egg omelet on your cutting board after cooling down. 3. Heat up around 1 tablespoon oil in wok over medium fire. 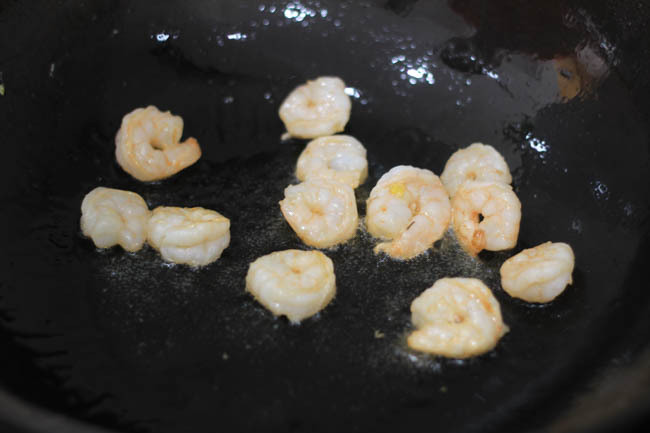 Add shrimp to fry for around 10 to 20 seconds until aromatic. Transfer shrimp out. 4. 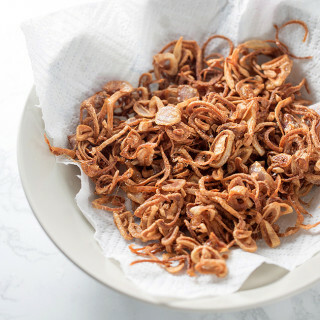 Then place side ingredients including carrot and red onion shreds to fry for another 30 seconds or until they are slightly softened. Place rice noodles in. 5. Add shredded egg omelet, shrimp, bean sprouts and chive sections. 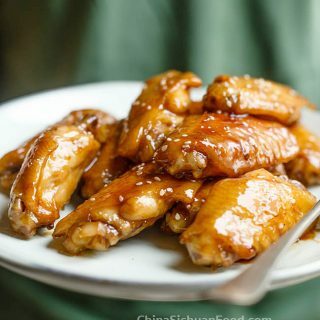 Spread salt and Chinese five spice powder and stir in the sauce. 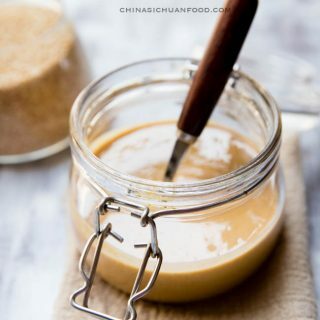 Make quick movements to coat all the contents with stir fry sauce evenly. Transfer out and serve hot. 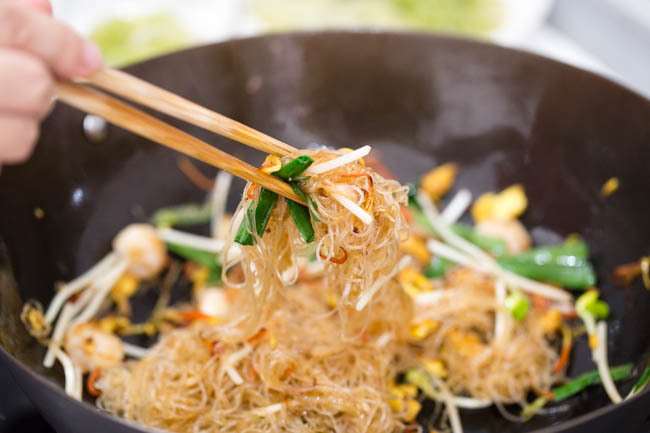 The best way to make a chow mai fun is use chopsticks. Pick some of the noodles up, shake shake before putting down. Then repeat the process until all the ingredients are well mixed. 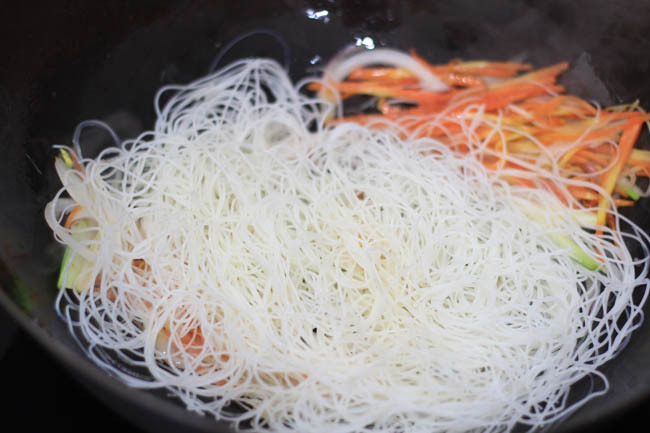 Pre-soak the rice noodles for around 20 to 30 minutes until soft and then drain. 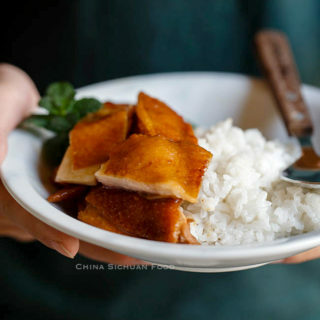 Slice other ingredients and mix the stir fry sauce in a small bowl. Heat up around 1 tablespoon oil in pan and make a thin omelet. Then shred the egg omelet on your cutting board after cooling down. Heat up around 1 tablespoon oil in wok over medium fire. Add shrimp to fry for around 10 to 20 seconds until aromatic. Transfer shrimp out. Then place side ingredients including carrot and red onion shreds to fry for another 30 seconds or until they are slightly softened. Slow down your heat and add Mai Fun in. 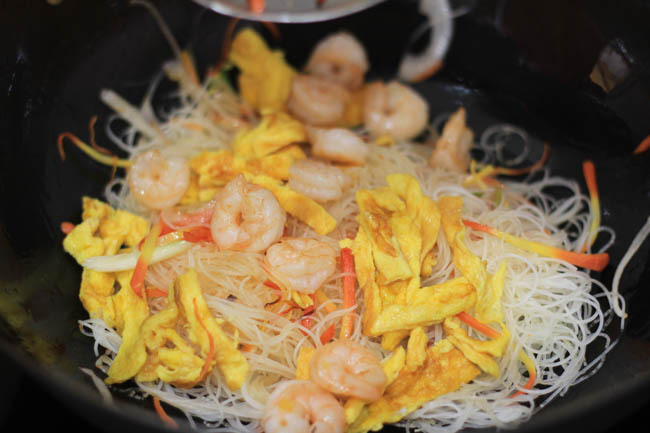 Add shredded egg omelet, shrimp, bean sprouts and chive sections. 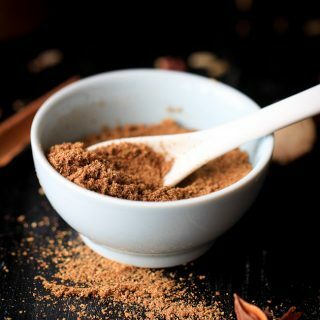 Spread salt and Chinese five spice powder and stir in the sauce. Make quick movements to coat all the contents with stir fry sauce evenly. 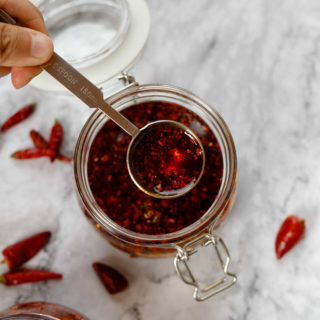 Transfer out and serve hot. To avoid the noodles from sticky, you need to keep medium to slow fire after adding the noodles. This turned out perfectly! Tasted just like in a restaurant!! 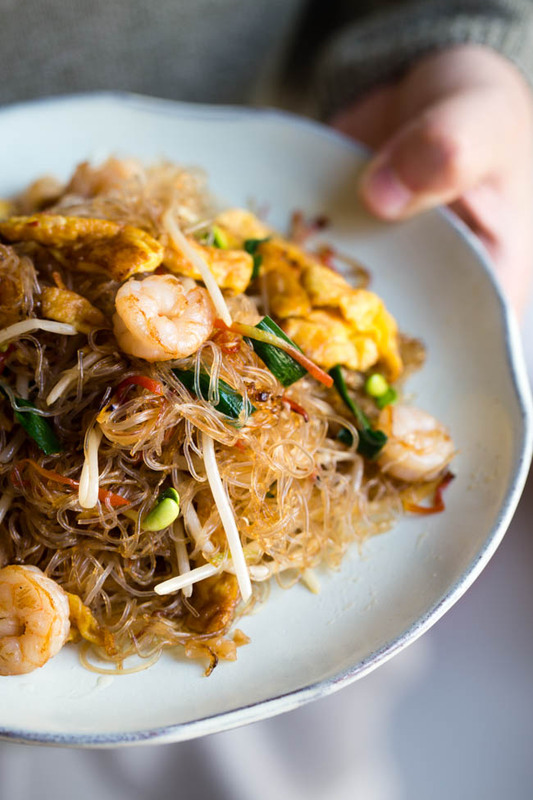 Thanks for the extra stir-frying tips – Up until now have always had a lot of trouble frying noodles in the wok. Thanks for the feedback, Melissa. Glad you love it and wish you have a nice cooking time with wok. Wow Elaine! this is amazing. I am sure I can follow this recipe on your blog. Thanks for sharing. 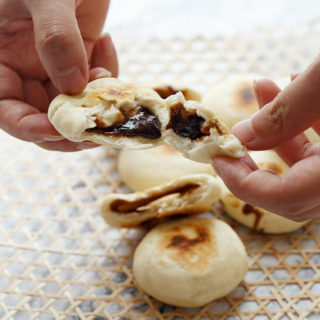 I was in Taiwan and I am looking for this recipe I can follow and found yours. Thanks Taylor, I’m glad you love it and let me know after you have tried this recipe. Hello Elaine, I have tried this recipe this evening for dinner and everyone has enjoyed it in my family, also mum and dad who are usually not comfortable with ethnic food. (I’m from Italy) but they really liked the taste and the savours! Just one problem: My noodles (I have found the rice sticks instead of Mei fun noodles)came out too dry, maybe I cooked them too much into the wok, I don’t know. I think I left them stir fry for about five, nope definitely more than five minutes, maybe ten. They were not very soft but the taste was good and I am going to give this recipe another try and another one and another one…. So glad I found your recipes can’t wait to try some and tell you about them. I’m going to look for you on Instagram, so excited.